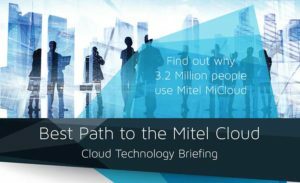 As Mitel’s cloud market share continues to grow, discover why more than 3.2M users have moved to the Mitel Cloud and what the future holds for cloud communications. Does this cloud have a silver lining? Understand the current business drivers for moving to the cloud. Find out how existing Mitel users can capitalise on previous investments. Learn how remote agents can be added to your call or contact centre via the cloud. Understand the benefits of both the private and public cloud solutions. Experience Mitel’s new mobile first IP Phones & Bluetooth Speakerphone in action. Discover how Mitel’s World Cloud solution can truly globalise your business. This interactive morning session is a great opportunity to learn about the latest Mitel Cloud solutions, including MiCloud Enterprise and World Cloud infrastructure requirements and deployment best-practice.